Washington Square is one of William Penn’s five original squares, this one being the southeast. It is located diagonally from Independence Square, making it very close to the heart of Independence National Historic Park. Much like Rittenhouse and Logan Squares, Washington Square is a very nice urban oasis, and is a break from the crowds of the nearby Independence National Historic Park. Also like Logan Square, a fountain is the centerpiece, although this one is much smaller than Logan’s. It is also simpler than the others, lacking the statues found at Rittenhouse or the enormous fountain at Logan. Washington Square is very peaceful and simple. Perhaps the most notable thing is the Tomb of the Unknown Revolutionary War Soldier, dedicated to those who died in the Revolutionary War. It is on the site of mass graves, where numerous unidentified soldiers were buried. 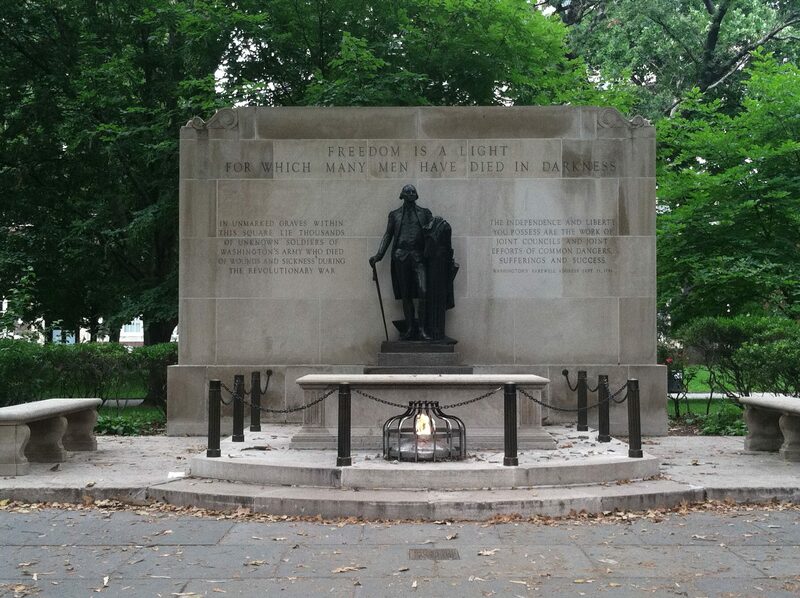 An eternal flame is under Washington’s feet, where he stands poignantly in front of the memorial. It is also the only memorial in the country to have an unknown soldier from the Revolutionary War.